I don't think there's a YA afficionado out there who doesn't know Becca Fitzpatrick and her incredibly famous Hush, Hush series. In fact, I would even consider the Hush Hush series as one of the series that started the YA Paranormal boom a few years ago (I'm sure you all know what I'm talking about...). With this in mind, I half-expected Becca's new project to be something 'paranormal' in nature - maybe there wouldn't be angels in the center of the story this time around, but maybe witches, vampires... you get my drift. Color me shocked when I found out that not only was the book, Black Ice, a psychological thriller, there was nothing remotely paranormal in its pages either! 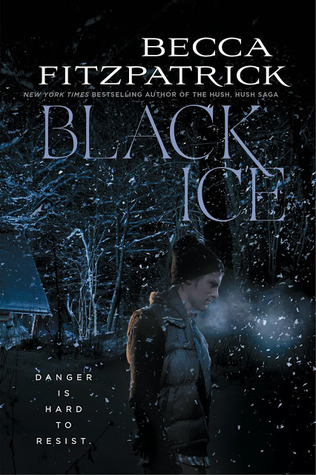 Once the initial shock wore off (because believe me, I was all geared up for another paranormal series to fall in love with), I sought to find out all that there is to know about Black Ice. The premise itself already had me hooked; the blurb even the more so. I already knew that I wanted to read Black Ice when I found out that it's a totally different genre from what I'm used to Becca Fitzpatrick writing, but the urge intensified all the more so when I personally heard Becca talk about it during her book tour here in the Philippines. It was just so adamantly clear that she poured her heart and soul in this book, and that this was a story that she really wanted to tell. I wouldn't call the premise wholly original or anything like that (because come on, we've seen this in movies time and time again), but I wanted to see how Becca would make this story her own. If I were to be a hundred percent honest, I didn't think I would like this book as much as I did. (Wait! I thought she was excited for Black Ice?, you may ask. Well, I am - I really am! I know, I know, I bet I'm confusing the hell out of you guys, but hear me out!) I've always had a weakness for thrillers, but if there's one thing I've come to realize after reading a number of them, it's that character development is barely there. Thrillers always tend to focus on the plot pacing and all those twists and turns instead of actually shaping the main characters, and that's something that's really grated on me over the years. As a reader, I do appreciate a good plot twist, but there's nothing more fulfilling than reading about a character who grows. This right here is the reason why even though I expected Black Ice to be an entertaining read, I never thought that it would be the kind that would make me tear through its pages like a deranged woman. But wow, was I ever mistaken! I read this one without stopping (and at an hour when I should be sleeping too!) and loved it. I was never bored, and while that was also because of the writing and the proper pacing of the novel, it was largely because of the main character, Britt. I loved how Becca Fitzpatrick managed to keep this book filled with heart-stopping action and the plot moving at a quick pace without sacrificing her MC's character development. At the start of the Black Ice, Britt was the kind of girl who never lifted a finger to fight for she wanted. She was content with letting other people do the dirty work for her, and she was used to following other people around. Initially, you can't help but roll your eyes at Britt. At first glance, everything about her screamed 'spoiled' and 'immature', and she definitely did not think through her actions throughout the first few chapters of the book. But don't give up Britt, folks, because believe me - she grows and matures A LOT throughout the happenings of Black Ice. She proved herself to be a selfless friend in doing absolutely everything that she can to save her friend from the sordid mess they found themselves in. She kept her wits through her fear, and she never ever even thought about giving up. Britt finding this strength within herself and ultimately discovering who she really is is the true selling point of Black Ice, if you were to ask me. I won't say that there were plot twists that surprised me - I don't know if it's just me, but the clues were easy enough to put together. I already had an idea what what the big 'ohmygod I did not see that coming' moment would be halfway through! Don't get me wrong - there were still parts wherein I had to scrunch my forehead and wrack my brain to figure out what the heck was going on, but there really weren't that many. Weirdly enough though, knowing what would happen didn't deter my enjoyment of the book. I think that has something to do with the writing (Becca's writing just flowed!) and how I can't help but root for the MC one hundred percent. I just wanted her to get out of this mess alive! I also like how there was such an emphasis on survival (against nature), rather than uncovering the mystery of just who earth these two fugitives are. Not only did Britt have to escape these two guys, she also had to survive through the snowstorm with only one map and barely enough food at her disposal! Another thing I liked about Black Ice is that the romance never overshadowed the mystery and the thriller aspects of the book. Overall, I can say with no doubts whatsoever that Black Ice is one of my top reads for 2014. The ending's a bit too prettily tied-up, but hey, I can ignore that given just how much I enjoyed the first 98% of the book or so!